‘Done’ criteria – Set for all user stories and cross-checked for adherence before signing-off. It is one of the most critical checkpoints of an Agile project. Business enterprises across the world are experiencing a common trend of increased client expectations, technology upgrades and unpredictability in their business environment. The magnitude of these changes and accompanying uncertainty is compelling most of the enterprises to adopt/follow “Agile” – a flexible and progressive software development process/model. 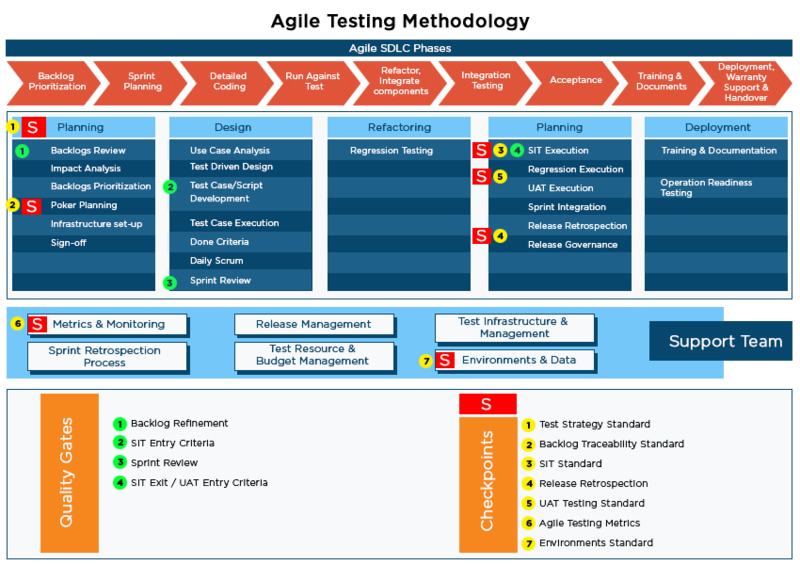 As per current trends, most of the Enterprises have gone one-level above and implemented agile scrum of scrums (SoS), an important technique in scaling scrum to large project teams for achieving their business objectives. SoS consists of clusters of teams working in a distributed environment making the situation even more challenging in communicating, governing and maintaining time to market. To address the above stated challenges, Cigniti has developed a matured and proven test approach that has the ability to seamlessly integrate with client’s agile development processes or hybrid development processes. This methodology ensures that testing is complementing development, helping in the early adoption of automation through Continuous Integration and implementation of testing techniques (TDD, BDD et al). This approach not only helps achieving time to market but also reduces defect slippage. 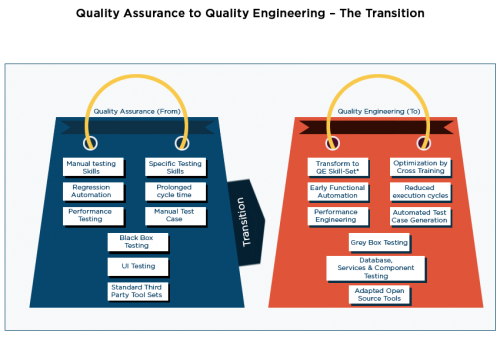 Quality Gates are inherent part of Cigniti’s Agile Testing framework. Cigniti’s quality gates come with a host of predefined policies and quality gate criteria that is customized based on client needs. Typically the criteria is a mixture of automated checks like passing unit and integration tests, code quality and guideline checkers as well human checks like peer review, approval from other stakeholders. Automatically enforcing quality gates ensures that the products meet the quality level and compliance conformance clients need in production. While Cigniti’s approach takes care of “quality and timeliness”, governance and communication are also primary concerns of clients adopting agile methodology. To overcome this, Cigniti has built a lean governance model that provides “right-level of information to right-stakeholders at the right time”. Cigniti has institutionalized metrics and measurement framework to track and monitor sprint velocity, burn rate, backlogs, sprint retro trends et al that provides performance visibility and confidence to all stakeholders (Dev, BAs, QA, Infra and Exec Team) for release readiness. 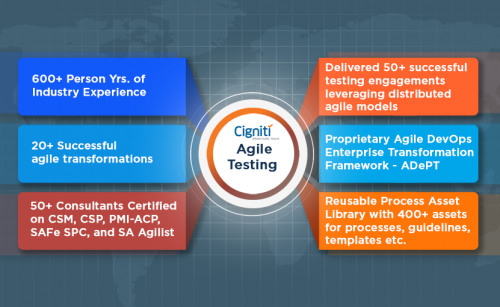 Cigniti delivers Agile Testing services with a combination of pre-built test suites that dovetail into the development environment and help to identify defects, eliminate redundancy and strengthen QA of the applications even as they are being developed. With a 6 step process that begins with Sprint planning and ends with Execution, our Core and Flex team work towards achieving true agility. Let Cigniti’s Agile Test Specialists perform a complete maturity assessment for your organization’s testing needs to help you get the most out of your agile projects. Cigniti’s Agile Testing Practice regularly publishes whitepapers to benefit the software testing community at large. These whitepapers help organizations adopt the latest Agile practices and integrate agile development and testing methods into new development projects. Cigniti has forged strategic partnerships with many of the industry’s leading testing tool providers. These relationships allow Cigniti to provide you with additional insights and assistance as you make critical technology choices in your agile application development lifecycle. Cigniti’s Agile Test Experts have successfully helped organizations achieve better business results and gain a competitive edge via the effective use of agile methodologies. By collaborating with Cigniti’s agile testing teams, our clients have been able to realize quantifiable business benefits including reduced time to market and shorter software release cycles. Cigniti’s end-to-end agile testing strategy and distributed agile framework has delivered these results to numerous clients who were looking to adopt agile methodologies in a practical way.